So let's go back to Austin — our opening night gala was at the "new-ish" downtown library. The building is beautiful and racks up all sorts of impressive stats, learn more here. 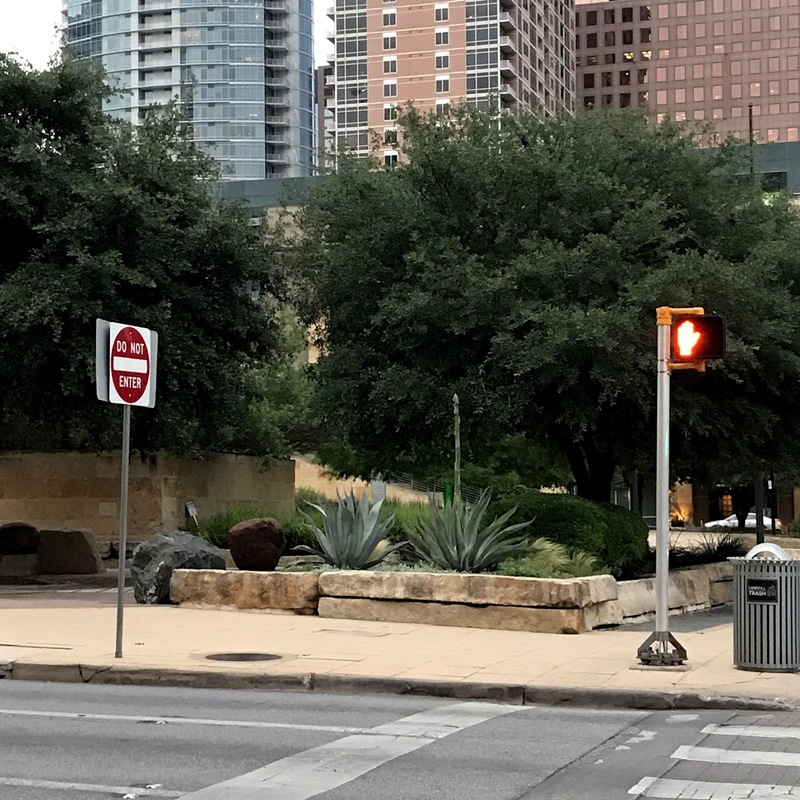 The library sits adjacent to Shoal Creek and the landscaping certainly plays to the site. The limestone walls and their sinuous curves define the location. On the top left hand side of the building, under the screened roof, is a garden. We'll be up there shortly. Heading into the library for the opening party I was torn between following the group inside, or exploring the plantings. I was hungry so I decided to head in. There were lots of good things out there to be seen, and the kid in me wanted to climb! After dinner we took the elevator up to the roof garden. It was all sorts of fabulous up there, above the city. Where a strong breeze helped to cool things down. I love the different furniture groupings. And the garden walls which could double as seating. I think this silvery soft-leaved beauty, with the fantastic seed pods, is Sophora secundiflora, aka Texas mountain laurel. We saw it in several gardens over the next few days. ...before heading down to the street level to do a little exploring. Must be a strong wind blowing through here to knock those Yucca blooms almost horizontal. Looking back at the library from the other side of the bridge. Wowsa! A nice roof-garden on a neighboring building. Looking up from below I thought the bridge might be for pedestrians only, that's not the case. After the event wrapped up a group of us meandered back to our hotel. 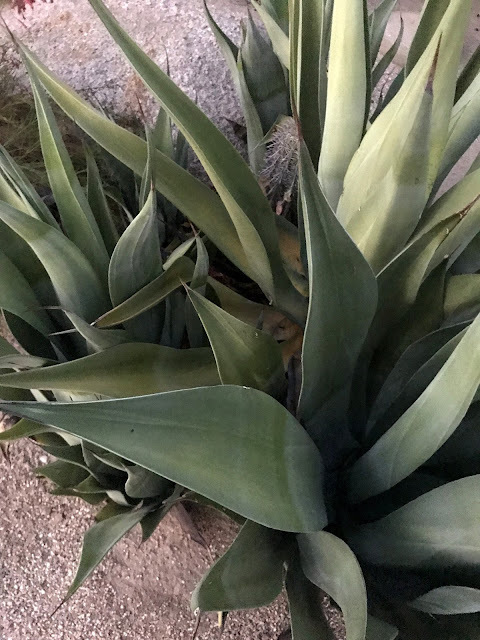 Of course there were several Agave photo-ops en-route. I tried to be a little sly in my photo taking, but I think everyone knew what I was up to. 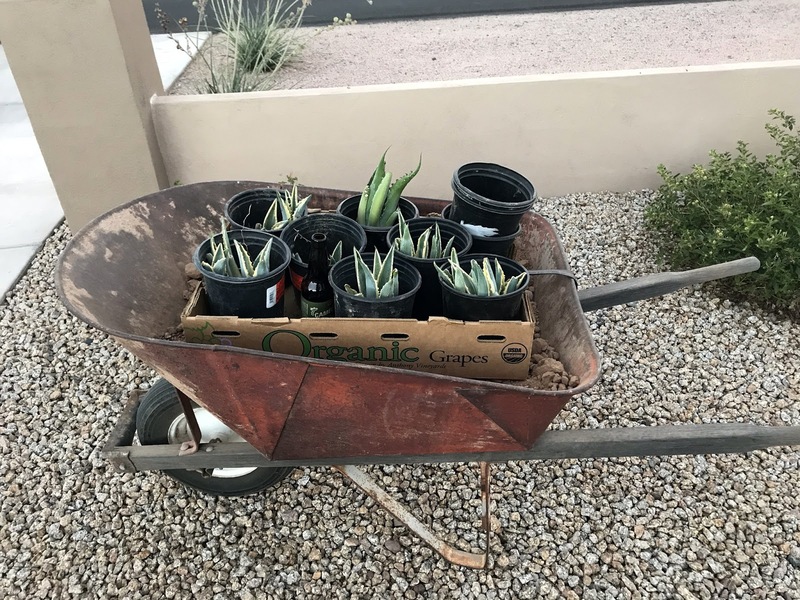 Phoenix Desert Nursery and an Agave Dig...aka "The Haul"
Wow, that's some serious deciation to watering. Drip emitters to run to each and every 1-gallon pot. 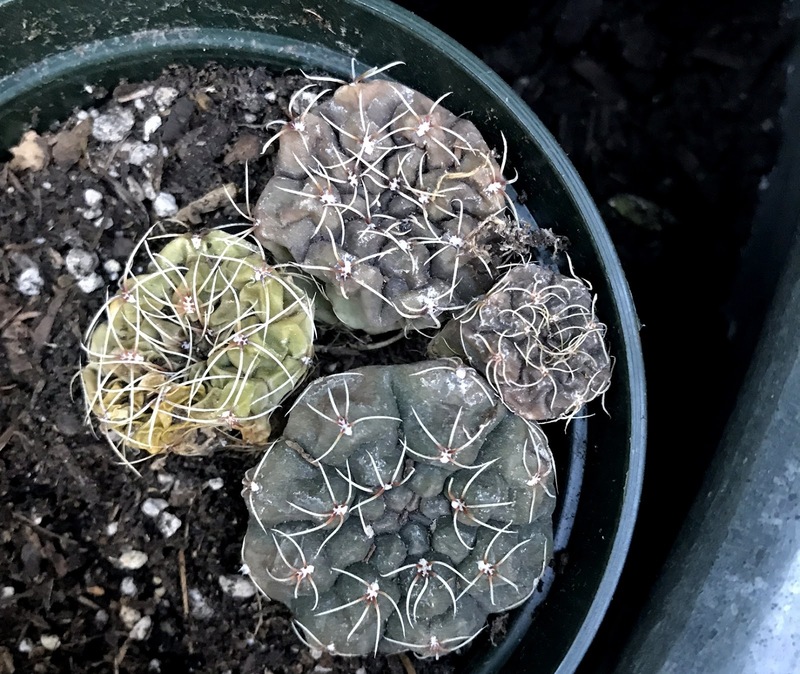 Did you spot the pieces of Tephrocactus articulatus that had broken off (above)? 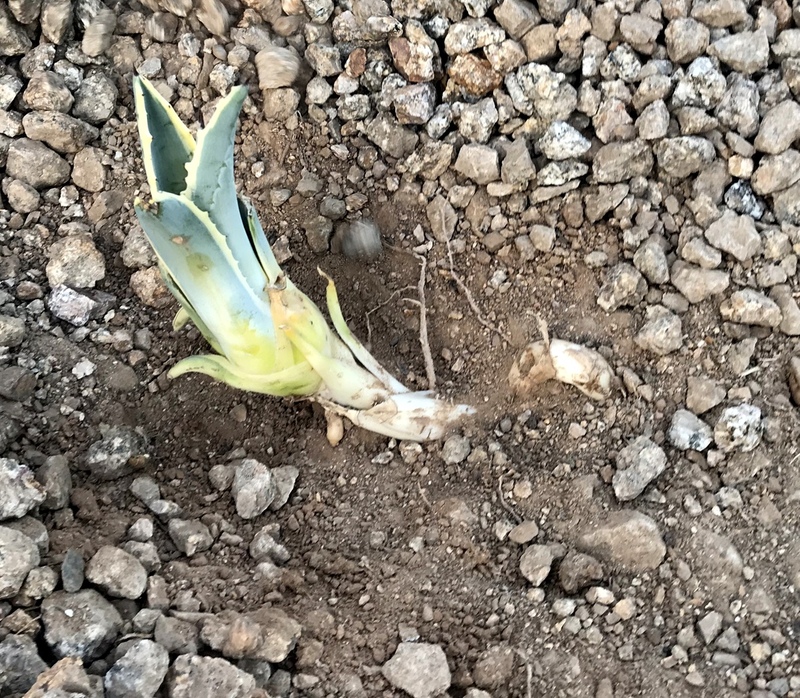 I so wanted to pick them up and put them in soil, or my pocket, but I left them be. These gallon containers were only $8...how would I ever chose? There were a few shade cloth tunnels. When cloth isn't available one improvises. Like a lath house, only not. I never did tire of the blue sky. There were only a few Aloes. Finally I made my choices and headed to what I assumed must be the office (I'd had no human contact the entire time I wandered). 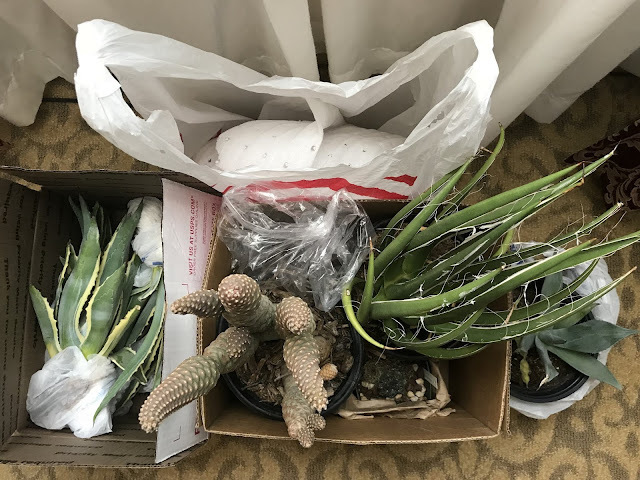 Here are my purchases, a pine-cone Tephrocactus and an Agave lechuguilla, only $15 for the pair. And here's the official Haul, as photographed in our hotel in Las Cruces. before I packed them up. You see the Tephrocactus and an Agave mentioned above, but where did those other plants come from? 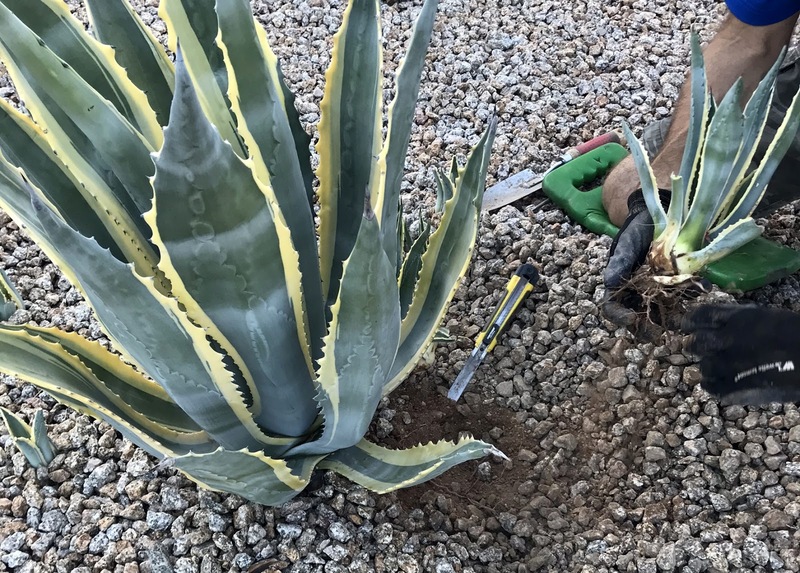 He'd been waiting to dig the Agave americana 'Variegata' pups until I visited, so he could share. How nice, right? This guy started to emerge from the soil, but then decided nah, I'll just do another dip down, and come up about 2" further away. I wonder why? 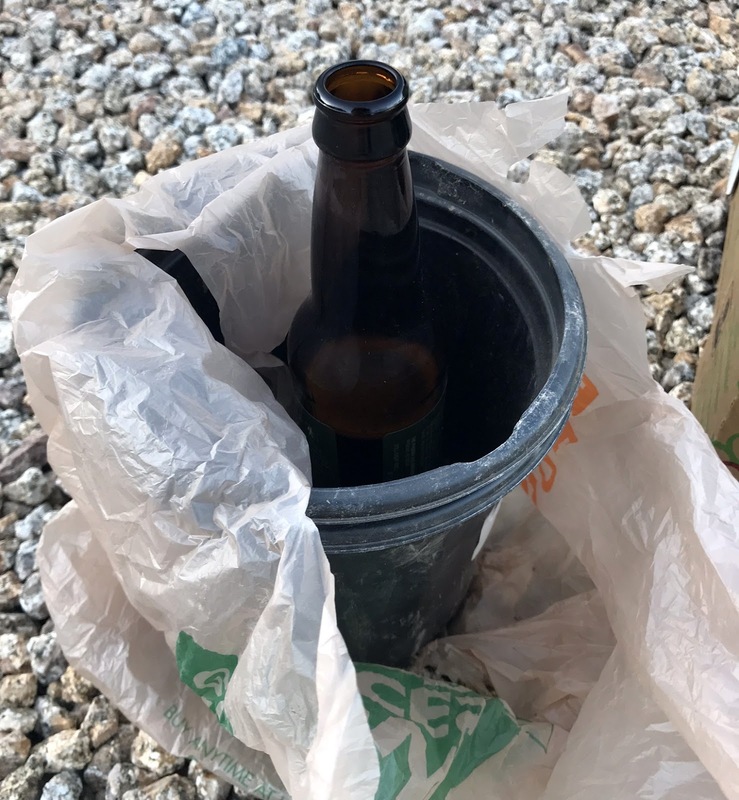 While a shot of tequila would have seemed like the official beverage of pup digging, Darin made due with a beer. 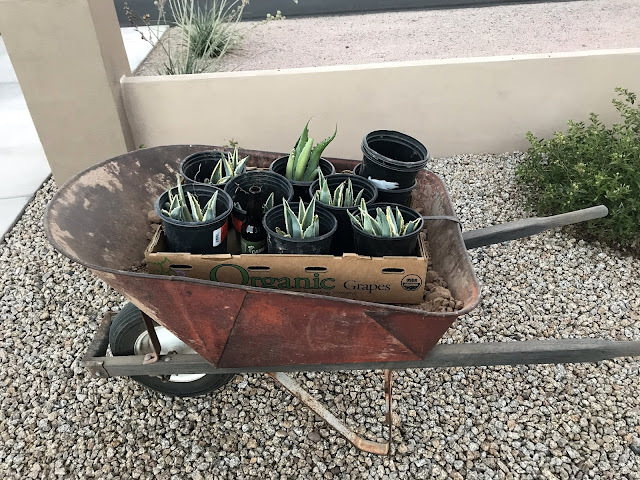 I boxed up four pups to bring home, here are the left-overs, which are destined for the back of the property where he's got his shop. 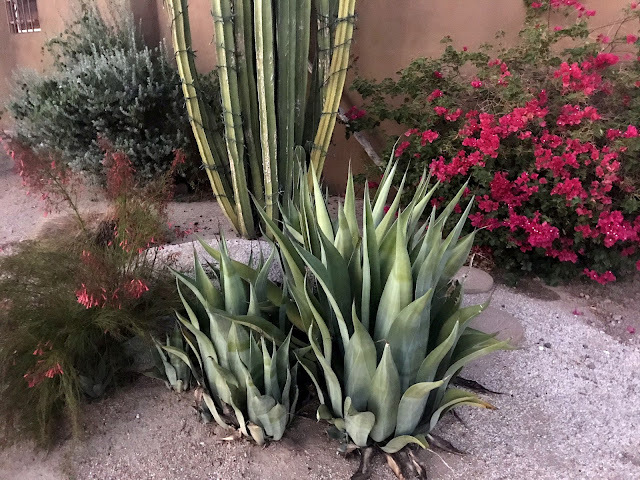 There's a nice little Agave landscape going back there. 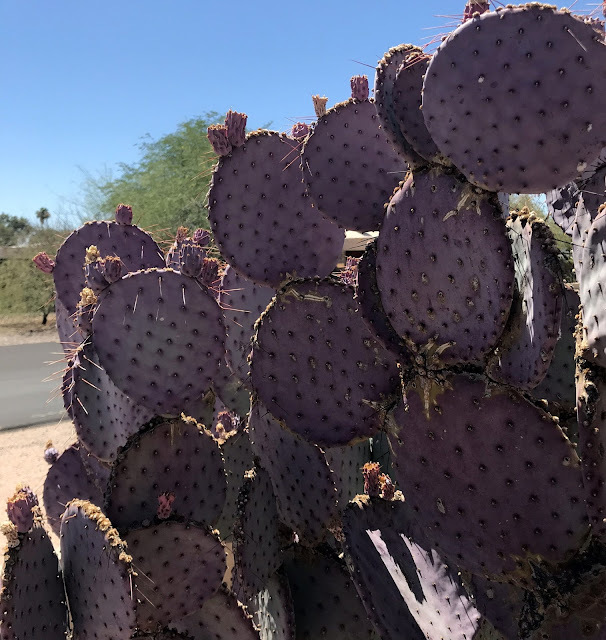 I also made off with a piece of his fabulous purple Opuntia. If it's Opuntia santa-rita then it's cold hardy here in Portland, it just needs to stay dry. I haven't decided yet if it's going in the ground or a container , but I am leaning towards trying it in the ground. After all, I know where I can get more. 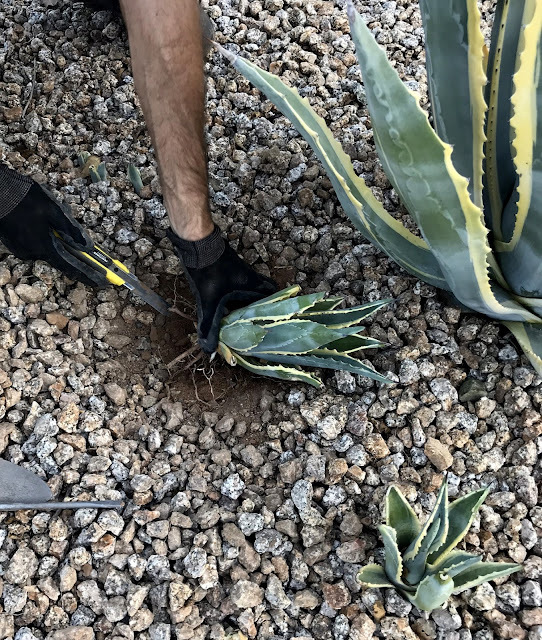 These lovely Agaves are growing in one of his neighbor's garden, Darin scored a couple of pups for himself and one for me too. 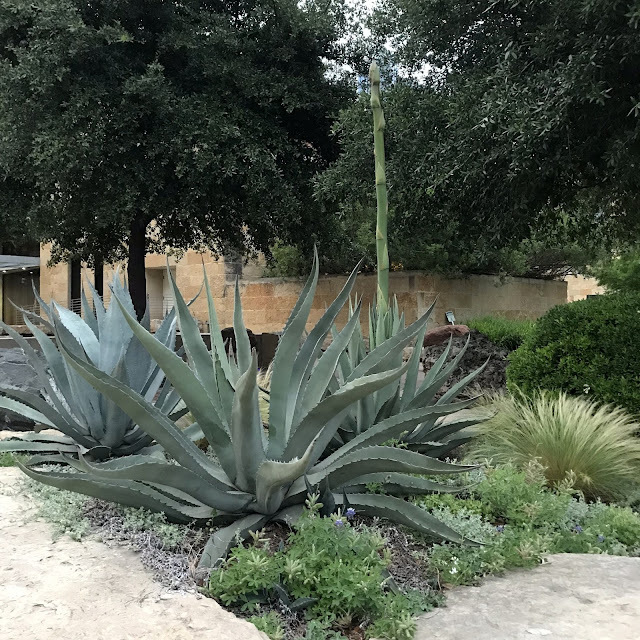 The neighbor called it a butterfly Agave, but that's typical the common name for Agave potatorum, which these are not. 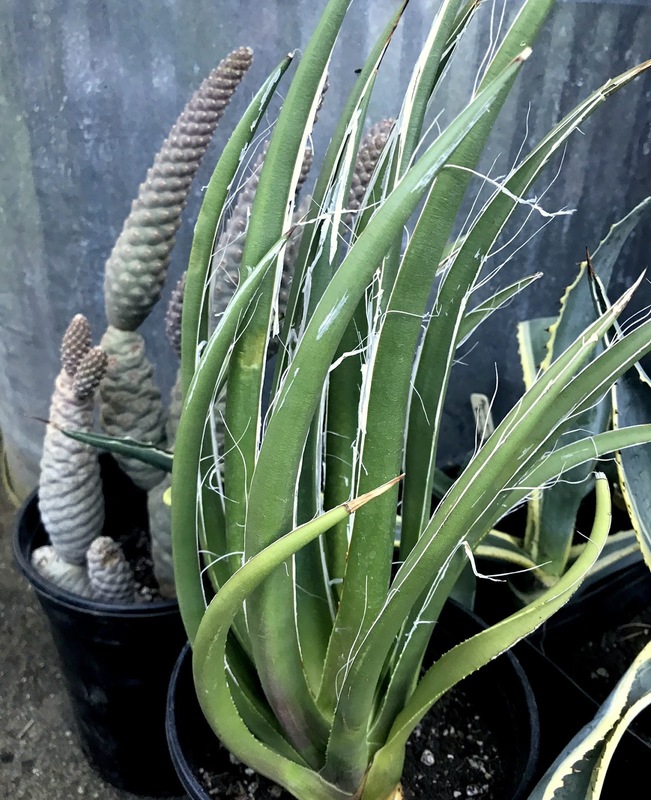 I thought maybe Agave weberi...what do you think?